If the NBA is known to be one thing, it is STAR STUDDED. Period. Part of the reason the game is so compelling is the phenomenal superstars that represent this wildly popular association. Being named an all-star in a league that is rich with talent is truly an honor. Only the best of the best deserve to be NBA all-stars. After listing the all-star starters that were already named, I am going to give you the names of the 14 players I believe should complete the 2018 all-star rosters. You want a ridiculously dynamic playmaker on one of the league’s scariest teams? I’ll give you one. His name is John Wall. The elusive point guard for DC’s team is more than deserving of his 4th all-star game appearance. Wall is averaging a cool 19.5 points per game to go along with his Eastern Conference leading 9.3 assists per game. He is also able to chip in defensively with his 1.38 steals per game and 1.11 blocks per game. Let’s show the Kentucky product his worth and give him yet another all-star game nod. Hoosier nation will love this one. How about Victor O? Wow. That is the only word to describe his season. Unless you want to go with a phrase. In that case, you can say ALL-STAR PLAYER. This guy is something special, and he is not done proving it. He is a huge reason and the main reason why the Pacers are having the surprise success that they are having. 24.3 points per game, 5.3 rebounds per game, 4.0 assists per game, 1.90 steals per game, and 0.90 blocks per game. Those are just some of Oladipo’s numbers this season. Not to mention, the steals and blocks lead the Eastern Conference at the shooting guard position. 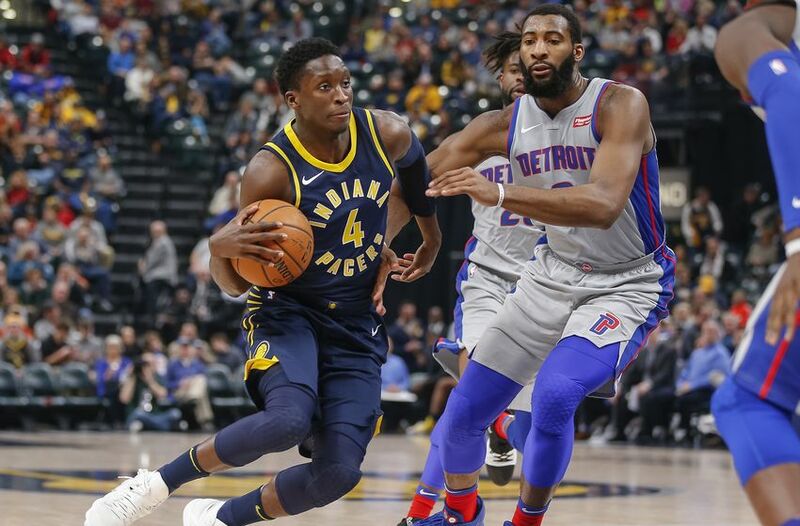 Do not tell me Victor Oladipo is not an all-star. He is. Brick wall in the paint on a hard-nosed basketball team. That’s how to properly describe Mr. Andre Drummond. He is a career 41% free-throw shooter and is currently shooting 63% this season. Hard work pays off and that is what has happened for Andre in 2017-2018. His Pistons allow the third fewest points per game in the East, 102.2, and a big reason why, is Andre Drummond. He is averaging a double-double in his sleep with 14.5 points per game and a league leading 15.1 rebounds per game. Andre also happens to be first in the East among centers in steals per game and assists per game with 1.57 and 3.9 respectively. The guy is balling out. They call him The Unicorn. I call him a 23.5 points per game all-star. His humble demeanor is well-respected amongst his peers and The Big Apple adores him. From the charity stripe he puts the ball in the bucket 81% of the time, which is 4th among Eastern Conference power forwards. His ability to stretch the floor is also well-documented with his 38% rate from behind the 3-point line. Overall, the Knicks are dropping games left and right. The Zing Man is certainly doing all he can to offer the Knickerbockers a chance to win. Al Horford gets very little respect for what he does on the hardwood, and that’s a shame. It’s about time the admirable veteran earns his praise. The Celtics are 1st in the East, 3rd in the NBA, and missing one of their three best players, Gordon Hayward. A HUGE reason they are having the success they are having? Al Horford. The 11-year man out of Florida has excelled pretty much his entire time in The Association. This year he is one of three players to be averaging at least 13 points, seven rebounds, five assists, and one block. The other two? LeBron James and DeMarcus Cousins. That’s pretty lethal company. In fact, that’s two all-star starters worth of company. Horford should be an all-star. In just his second year in the NBA, and his first-year on the court, the rookie out of LSU has taken the NBA by storm. He and Joel Embiid have helped lead their Sixers to the current 7-seed in the Eastern Conference. Pretty impressive after Philly has spent the past 5 years in the gutter. The Process is certainly working in Philadelphia. Simmons has off-the-chart numbers. While his 16.6 points per game are more than impressive, his rebound and assist averages are what should frighten the rest of the league. He is second among point guards in the NBA with eight rebounds per game, fourth among NBA point guards with 7.2 assists per game, second among NBA point guards with 0.93 blocks per game, and fourth among NBA point guards with 1.88 steals per game. His ability to drastically change the game in more than one way is what makes him so fantastic. Simmons is having no issues adjusting to the big-leagues. ALL. STAR. Choosing this final Wild Card spot was extremely difficult. There are always snubs when it comes to an all-star game. Players like Kevin Love, Dwight Howard, Kemba Walker, Khris Middleton, Kyle Lowry, Dennis Schroder, and others are all having commendable seasons thus far. Beal however, gets the final nod for me here. He is 7th among Eastern Conference players with 23.8 points per game, and is logging a heavy 35.9 minutes per game for the frisky Wizards. He is also 5th among field goals made in the entire NBA and has yet to be named an all-star in his career. This year should be his time. It’s extremely tough to be an all-star starter in the Western Conference. The conference is literally loaded with top-level talent everywhere you look. That is pretty much the only reason why the reigning MVP is not an all-star starter this season. The guy is a baller. Put the ball in his hands and just sit back and watch the magician go to work. He is averaging a near triple-double with 24.8 points, 9.7 rebounds, and 10.1 assists. BALLER! Some may be very surprised with this pick. Don’t be. Dame may not get the nod because he constantly gets snubbed, but I am here to tell you that the Weber State alum deserves to be an all-star this season. The Blazers are not that talented, and they are 6th in the daunted Western Conference, sitting 4 games above .500. Damian Lillard is the main reason why. He is averaging over 25 points per game, 4.8 rebounds per game, and 6.6 assists per game. Over Rip City’s three-game winning streak, he hasn’t scored under 26 points. Dame is the leader of this team, and they will need him to perform at this elite level in order to shock the world in the Postseason. There were rumors that Aldridge requested to be traded before this season started. After talking with Coach Pop, Aldridge decided to remain in San Antonio. That was a win-win for he and the Spurs because Kawhi Leonard has unfortunately been unable to play for much of this season due to injury. Insert throwback LaMarcus Aldridge and the Spurs are still pretty much rolling. San Antonio’s big man has TWENTY double-doubles already this season, which is remarkable. He is contributing a scorching hot 22.3 points per game to go along with his 8.7 rebounds per game. Aldridge seemed to be on the decline for a while, but ladies and gentlemen…he is BACK! This. Man. Is. Special. Do you hear me? SPECIAL! The Jersey Boy is 22-years-old and averaging a double-double in the NBA. 20.2 points per game to go along with 12 rebounds per game. KAT is also contributing 1.6 blocks per game and has FOURTY double-doubles on the year. That is just plain ridiculous. This guy is well on his way to an enormous contract. Minnesota should be drooling. Heading to Los Angeles? Maybe. But first he wants to ball-out in OKC. Paul George is having a great season. Do not overlook this man. PG is averaging nearly 21 points per game and is leading the NBA in steals per game with 2.2. He has made the Thunder a better overall defensive team, and has taken some of the humongous burden off of Russell Westbrook’s shoulders. Carmelo Anthony has heated up a bit recently and will need to continue to do so, but Paul George has certainly come in and done his part. It took some time for Paul George to adjust to his new team, but the Thunder will be a very scary team in the Playoffs. Many people believe Karl-Anthony Towns is the biggest reason for the Timberwolves’ improvement this season. Some believe it is Andrew Wiggins. And some even believe it is Tom Thibodeau. Wrong, wrong, and wrong. It is Jimmy “Buckets” Butler. KAT is phenomenal. Wiggins is a great young player. Coach Thibs is doing an awesome job. But Jimmy Butler is the main reason why the Minnesota Timberwolves are one win away from matching their win total from all of last season. The Wolves are 30-18, third in the loaded Western Conference. Butler is averaging 21.7 points, 5.4 rebounds, and 5.0 assists per game. He is also 4th in the entire NBA with 2.0 steals per game. I would not want to face the Jimmy Butler led T-Wolves in the Postseason. Draymond probably thinks he should be an all-star starter. You know what? Draymond probably believes he should be an all-star CAPTAIN. For now, I’ll go with just all-star, but that’s still fantastic. The glue that holds the best team in basketball together is Mr. Green. Period. Lock-down defender is an UNDERSTATEMENT. He was picked 35th overall in the 2012 NBA Draft but each and every game, he reminds NBA teams that they all made a huge mistake on passing him up. He only averages 11.3 points per game but adds 7.9 rebounds per game, 7.6 assists per game, 1.3 steals per game, and 1.3 blocks per game to go along with the points. Draymond is on the Warriors; he doesn’t need to score much. Come June however, he’ll be ready to do whatever is needed of him. I fully expect him to be a huge reason the Warriors win another NBA title this season. Yes, my West predictions are loaded with snubs. But that’s what will happen in the stacked Western Conference. Devin Booker, Lou Williams, CJ McCollum, Klay Thompson, DeAndre Jordan, Clint Capela, Nikola Jokic, Blake Griffin, Tyreke Evans, and Chris Paul are just a few. The 2018 NBA All-Star Game should be an absolute blast to watch. With a new format consisting of a draft instead of the traditional East vs. West format, the game should be even more entertaining. From alley-oops, to vicious slam dunks, to near half-court threes, this one should be a straight doozy. Sunday, February 18th at 8 p.m. Eastern Time you know where to be…in front of your TV.